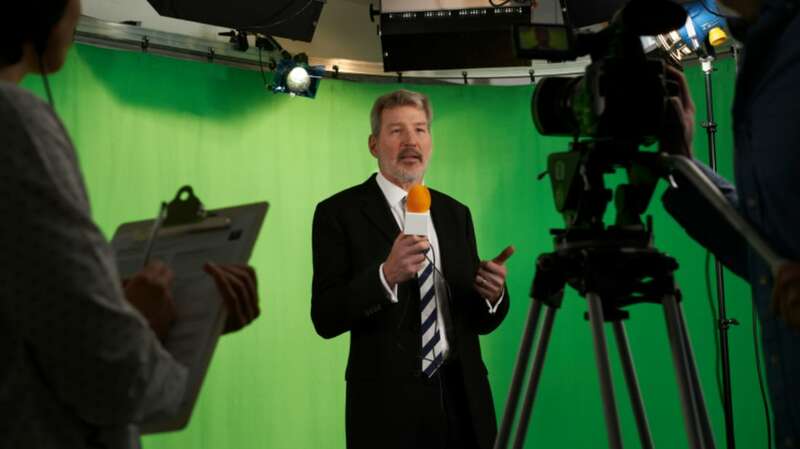 The satire may have hit close to home for actors involved in Game of Thrones, the Marvel universe movies, or the countless other productions, both lavish and low-budget, that rely on a technique called chroma key for visual effects and fantastic scenery. Some actors spend hours in front of green backdrops, imagining the alien hoard, billowing fireball, or towering castle that special effects pros will later add digitally. “You kind of forget the plot a little,” said Idris Elba of working in front of a green screen on Thor, adding, “It’s a bit of, ‘Wait, what is this again? Oh, right, Frost Giant. Okay.'" Out of all the colors on the spectrum, why green? Why does that particular hue work best for leaving a blank into which special effects can be painted? The truth is, it doesn’t. Chroma-keying is the process of isolating a single color or brightness value in an electronic image and then making that value transparent in post-production, allowing another image or footage to be placed “beneath” the color that’s been blanked out. Although green is used so often that “green screen” and “chroma key” have become almost interchangeable, any color will work. Green is the go-to because it doesn’t match any natural skin tone or hair color, meaning no part of an actor will be edited out through chroma key. When a green costume or prop is essential, a blue screen is often substituted. This caused a complication for the 2002 Spider-Man movie. Filmmakers had to use a blue screen for effects shots of the Green Goblin. But blue is an integral part of the web-slinger’s color scheme, so they switched to green screens for shots of the hero. Additional tricks and special effects were used to get the two characters in the same effects shot. Makers of the Justice League movie, which will inevitably feature Superman and Green Lantern side by side, take note. While the technology might seem complex, Hollywood has been using chroma key since 1940’s The Thief of Baghdad, and local newscasts utilize it to put a meteorologist in front of a graphics outlining the forecast. This is one reason why weathermen (and weatherwomen) need to be mindful of what tie or dress they wear.